HANGZHOU /China/, October 1. /TASS/. China’s Commerce Minister Zhong Shan and Eurasian Economic Commission (EEC) Trade Minister Veronika Nikishina on Sunday signed a joint statement on finalizing the negotiations process on the trade-economic agreement between the Eurasian Economic Union (EAEU) and China. The ceremony took place in the city of Hangzhou (the capital of China’s eastern Zhejiang province), where between September 26 and 30 the countries had the fifth round of talks on the agreement’s parameters. "The first item of the statement is that we have finalized all the talks on the contents. Further on, the joint statement says we shall inner-state procedures to agree the text, and then we shall organize a binding legal adjustment of the documents to begin preparing them for singing," Nikishina told TASS. Another item, she continued, says that the agreement’s signing would be after receiving of a mandate, which will be issued to five leaders of the EAEU countries. "This document fixes end of the formal talks and launches already the procedure of signing," she added. On Saturday, she told TASS: "We have finished the talks indeed. Tomorrow, as I hope, we with China’s Commerce Minister Zhong Shan will sign a joint declaration that the talks are over concerning the agreement on trade and economic cooperation between the Eurasian Economic Union and China, which will enable us to launch proceedings of intra-state harmonization and preparations for the document signing." The substantive part of work has been completed and just technical formalities are to be finalized, according to the minister. "This round happened to be very important and crucial for us," Nikishina said, noting that the talks had managed to solve the issues unsolved at expert-level meetings. "We have really managed to do it," she said. "Everything has been finalized which we wanted to file requests for. We have ended the substantive negotiations, have drafted the text that formulates these agreements," Nikishina said. "In fact, we have initialed the text and now we should settle technical formalities for procedures of legal reading through the wording." The minister did not comment on a deadline for the agreement, assuming that a huge amount of time-consuming work is yet to be done. It was related both to internal procedures at the EAEU and translations of the agreement into seven languages, namely English, Chinese, Russian, Belarusian, Armenian, Kyrgyz and Kazakh. "We are obliged to report to our union’s five presidents and the five should have consensus so as to put their signatures under the decision granting us with the right to sign the agreement," the minister said. Besides, "a lengthy technical procedure is required in order to have all the texts translated into these languages and have their authenticity checked," she said. Negotiations on the agreement on trade and economic cooperation between the EAEU and China have been in full swing since 8 May 2015, following a ruling of the Supreme Eurasian Economic Council. In May 2016, the EAEU and China signed a joint statement on transition to a stage of drafting the document. 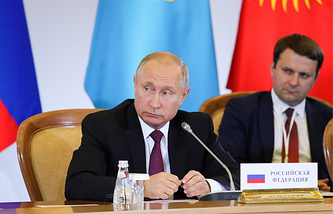 The talks brought together officials of the Eurasian Economic Commission and of EAEU members’ governments along with Chinese experts and officials.